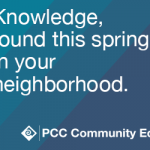 Justin is the Graphic Designer/Communication Assistant for PCC Continuing Education. His responsibilities include designing departmental promotions, student support and customer relations. Justin has an Associates of Applied Science in Graphic Design from Portland Community College and has worked for at PCC since 2008.